The Ministry of Agriculture’s move to make potatoes an increasingly important staple in Chinese kitchens, including the propagation of recipes that rely on the humble tuber, at first glance might appear slightly odd and surprising. The potato has been an important part of the Chinese diet for at least four centuries after its introduction to the country by Portuguese traders in the 1600s, but cereals such as rice, wheat and corn remain the main carbohydrates consumed in Chinese households. But a switch to the potato, which literally means as ‘earth bean’ when translated from chinese, could help deliver the central government’s aim of self-sufficiency in essential carbohydrates and enhance food security. For decades, self-sufficiency in grains has been the cornerstone of the country’s food security strategy, but domestic production has fallen short of rapidly growing demand in recent years, driven by population expansion and changes in diet. Consequently, China refined its food security strategy in December 2013, with the government realising the need for moderate imports besides a high degree of self sufficiency. But that aim is looking increasingly out of reach. Last year, despite enjoying the 11th consecutive year of bumper grain harvest, the country still imported a total of 70 million tonnes of soybean and 25 million metric tons of grain, accounting for a 22% year-on-year rise. As China struggles raise the level self-sufficiency in producing food staples, adding the potato as a new staple appears to be an easy solution. Unlike domestic production of cereals, where demand has fast outgrown production and has little potential for further expansion because of shortages of available land, China’s domestic potato production looks much more promising. The country enjoys a surplus in potato production and is the world’s 10th largest exporter of the crop. And potato yield per hectare is much higher than that of cereals. In 2012, according to China’s official statistics, the country’s average yield per hectare is 27.2 tonnes for the potato, much higher than cereals at 6.8 tonnes. Crucially, more people can be fed with potatoes produced per hectare compared with alternative crops grown in the same-sized patch, as potatoes pack much more energy punch than cereals. And while China is the world’s largest grower of potatoes, with annual production in 2013 of around 90 million tonnes, its yield is lower than the global average. That means China has plenty of potential to increase its potato production without expanding plantation areas. Apart from contributing to the country’s food security, greater use of the crop could contribute to long term sustainability of China’s agricultural sector. Owing to intensive farming and overuse of fertilizers and other pesticides, China is facing major land degradation and chronic water pollution. According to official reports, over 40 percent of soil in China's arable land is depleted. While the government pledges to spend “tens of billions of yuan” each year to clean up land that is heavily contaminated with metal and restore over-exploited ground aquifers, current grain production is likely to be affected, as witnessed by figures showing sky-high levels of cadmium in rice grown in Hunan. To safeguard current domestic cereal production and achieve sustainable agricultural development, adding the potato as a staple could potentially end cultivation of other food crops on land that is blighted by medium-to-heavy pollution. Interchangeable fallowing or crop rotation on the depleted land is also possible. A big switch in favour of potatoes might also help correct some of the growing imbalance in agricultural production between the north and the south. After centuries of concentrating grain production in southern regions where climate is favourable and water is abundant, the country’s grain production is shifting to the parched north, necessitating the construction of a vast US$80 billion project to transport water to arid areas. 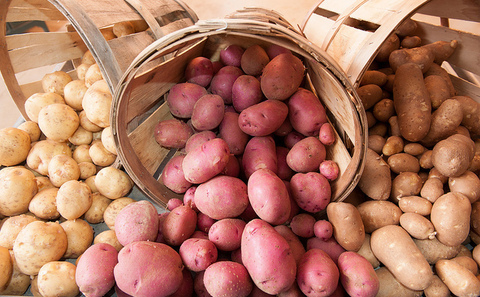 Potatoes would draw upon less water and be able to rely much less on irrigation. According to a Chinese study, in China the minimum water requirement for potato is only 350mm, whereas rice and wheat are 500mm and 450mm respectively. Therefore, this makes the potato an ideal rain-fed crop grow in the north and west, where annual precipitation is around 350 mm. The government plans to increase the potato plantation area from the current 5 million hectares to 10 million hectares in 2020. If achieved this would help to slow demand for fresh water from agriculture, which currently accounts for around 70% of China’s total demand. Profitability from the cultivation of potatoes is also much higher. In 2012, net profit for potato production per hectare in China was close to RMB 15,000, whereas grain production was only around RMB 2,500. In addition, potato production is about two times more labour-intensive, creating more jobs for impoverished rural residents. What will go in the wok? Although adding the potato as a new staple has great potential for China’s food security, the greatest challenge will be changing the preferences and habits of the typical Chinese consumer. While potatoes have been an important part of some Chinese cuisines, a big switch would involve consumers foregoing noodles and steamed bread made of rice, wheat and corn and opt for potato-based food products instead. In China, rice wheat and corn are considered strategic commodities which are believed to be too important to be left to the markets. Therefore, the state directly controls grain production, processing, storage, as well as internal and external trade. Granting potatoes the status of a staple naturally raises an important question: Will the Chinese government try to regain direct control over the potato sector? As the largest potato producer and a major exporter, China’s decision will certainly have a major impact on regional and global markets.